We love simple sheet pan dishes here at the Common Housefly test kitchen. They are (usually) simple to prepare and easy to clean up. We have also been trying to incorporate more plant-based meals into our routine and this recipe fits the bill on both counts. We found this recipe at the Washington Post, made it last week, and enjoyed it as a straightforward weeknight meal. A sheet pan makes this version of a Tex-Mex staple simple enough to pull off on any given weeknight. I hope you give this one a try. It has all the satisfying goodness of a traditional fajita with the added benefit of being a simple sheet pan recipe. For the fajitas: Place a large rimmed baking sheet on the middle rack in the oven; preheat to 450 degrees. Whisk together the lime juice, oil, chili powder and salt in mixing bowl. Add the sweet potato, poblanos, onion and mushrooms, tossing until evenly coated. Carefully remove the baking sheet from the oven. Working quickly so the pan stays hot, arrange the vegetables on it in an even layer. Roast until the sweet potato is tender and the other vegetables are deeply browned on the edges, 15 to 20 minutes. Taste, and add more salt, as needed. During the last few minutes of roasting, wrap the stack of flour tortillas in aluminum foil and place in the oven (on a lower or upper rack) to warm them. 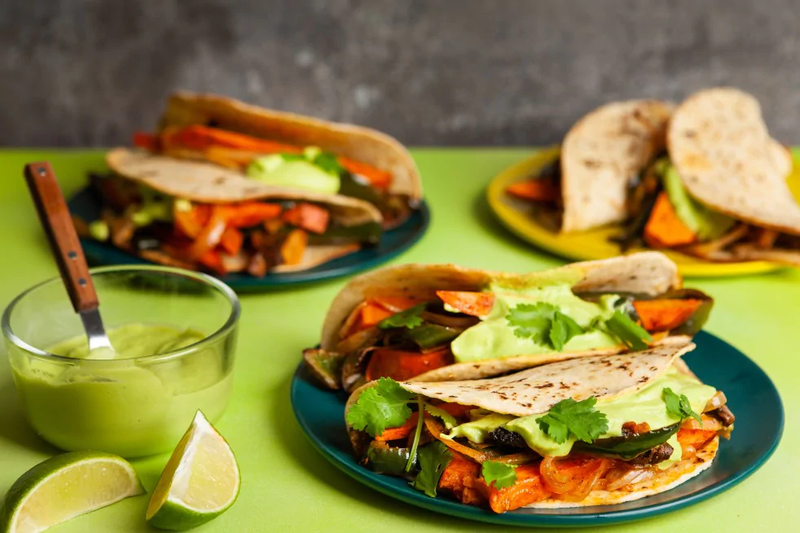 While the vegetables are roasting, make the crema: Combine the avocado, coconut milk, lime juice, serrano, cilantro and salt in a food processor or blender and puree until smooth. Fill the warmed tortillas with the roasted vegetable mixture. Add dollops of the crema and some cilantro to each portion. Serve with the lime wedges.